Book Release Party for Prof. Nora Krug's "Belonging"
The School of Art, Media and Technology at Parsons School of Design cordially invites you to attend the book launch for Belonging – A German Reckons with History and Home, Nora Krug’s illustrated WWII memoir, which will be published by Scribner this October. Krug is an Associate Professor in the Illustration Program at Parsons School of Design. 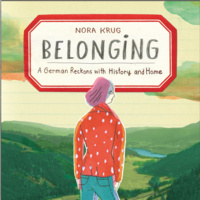 Belonging tells the story of Krug's attempt to confront the hidden truths of her family's wartime past in Nazi Germany and to comprehend the historical and personal forces that have shaped her life as a German growing up in the second generation after WWII. The memoir is equal parts graphic novel, family scrapbook, and investigative narrative, and it combines drawings and hand-lettered texts with family photographs, letters and documents, archival materials, and flea market finds. Belonging is a reflection on guilt and memory, on the meaning of national identity, and on the responsibility that we all have as inheritors of our countries’ pasts. Copies of Belonging will be available for sale at this release party and refreshment will be served. Please contact Maura Gingerich in the School of Art, Media and Technology with any questions about the event. Presented by Parsons School of Design, The School of Art, Media and Technology and the BFA Illustration program at Parsons.